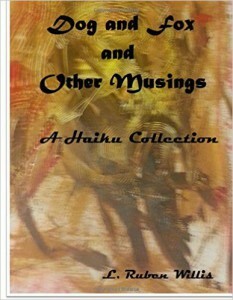 I wanted to let you all know about a good friend of mine who recently published the most awesome collection of haiku. L. Ruben Willis is one of the most prolific writers I know. I have followed his writing adventure for over a year now, and am always intrigued by his words. Dog and Fox, and Other Musings is certainly no exception and I believe you will be very pleased with it. You can find it on Amazon here, and – for the month of November, 2015 – you can get your Kindle edition for the very special price of just $2.99! It’s a steal! Other formats are also available, so go have a look!